We are the leading bail bond agency in Texas providing licensed bail agents 24hrs a day 7 days a week to work with you. Our agents are experienced and trained to understand your situation during this tough time. Our goal is take the necessary steps in providing all the information about how to process a bail. We will explain to you the bail bond process and answer all the necessary questions you may have. From the initial phone call to the defendant being processed out of jail we will be right with you. At anytime you have any additional questions our agents will be available 24hrs a day. Our clients in South Texas can be rest assured that there bail bond will be process quickly and ethically. We provide 24hrs a day service 7 days a week customer service to all our clients. 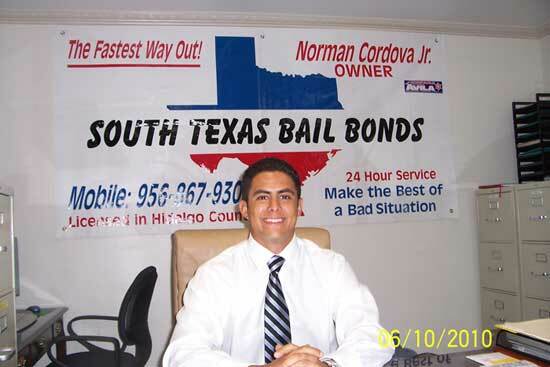 Why South Texas Bail Bonds Instead of Other Agencies? We provide our clients with the best possible service. The testimonials we receive from satisfied clients proves we willingly go the extra mile. We take pride in being reliable, professional and reputable. We serve the community 24 hours a day, 7 days a week. In South Texas, we cover all of Edinburg, Hidalgo and Weslaco Counties. We are a licensed bail bonds agency dedicated to providing fast, knowledgeable service. For the past 7 years, our agents have been writing bail bonds on a variety of cases, including assault,burglary, traffic tickets, drugs, DUI, bad checks and non-arrest warrants. For those who qualify, we offer 0 percent interest to help get through this difficult time. Time is of the essence when dealing with bail bonds. Our agents are prompt, courteous and ready to go to work for you no matter when you need us. Contact South Texas Bail Bonds at 956-377-5381. We have the experience and the know how to get the job done and can guarantee our work.